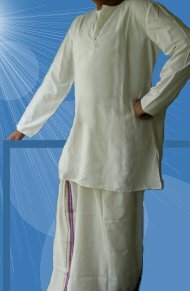 Jubba is a plain long full sleeved dress worn by Kerala men. It is not a dress of daily use. On special occations and events men like to wear Jubba with Mundu or Jubba with Jeans. The new experiments in Jubba are Embroidary, sequins work and bright colours. The material can be cotton, silk, khadi, etc.